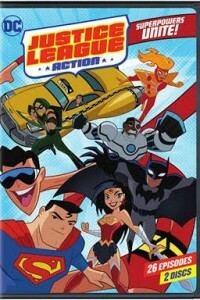 Witness the Justice League like never before in this all-new animated series where the pace is quick, the action is relentless and the fun is non-stop! The “Trinity” of DC’s Justice League– Superman (voiced by Jason J. Lewis), Batman (Kevin Conroy) and Wonder Woman (Rachel Kimsey) – are joined by a galaxy of rotating allies and enemies like John Constantine, Zatanna, Booster Gold, Plastic Man, Lobo, Mr. Freeze, Black Adam and Swamp Thing. The Super Heroes must battle enemies that include space invaders and bizarre forces of magic as they try to defend Earth from Super-Villains intent on destroying the planet. No matter the threat, the Justice League is ready for the challenge.